As I write this page, the Union minister for environment and forests is deliberating whether Bt brinjal can be grown and eaten in India. So, at the outset, let me make my own bias clear. I am not an anti-GM person; I have no ideological problems with the use of genetically modified technology to improve crop yield. But I am definitely anti-Bt brinjal: I believe it should not be given clearance. My reasoning is as follows. First, we are talking brinjal: genetically modifying, for the first time ever, a vegetable that, moreover, is a common food of near daily use in all our homes, sometimes uncooked. So we cannot judge such technology modification at par with Bt cotton, which is at best used as fodder or processed to make cottonseed oil. Indeed, all other GM crops used widely across the world are either eaten in processed form (soya) or used after industrial refining (corn or rapeseed oil). Thus, in this case, simplistic correlations—that genetically modified crops are safe, or known to be so—cannot be applied. Second, the jury is out and still arguing about the tests done to establish the safety of this gene-modified vegetable vis-a-vis our health. The debate centres around two issues: whether enough has been done to study the chronic impact of eating this daily vegetable on our bodies and health, and who has done these studies. The studies by Monsanto- mahyco —the owner company—show the bulk have looked at acute toxicity, a lethal dose 50 or more, a dose at which there would be mortality of 50 per cent or more. The company has also done studies on allergic reactions and skin irritation. On the other hand, studies on sub-chronic toxicity are few—90 days on rats, rabbits and goats. The question that then emerges is: are the studies good enough to understand the long-term impacts of ingesting Bt brinjal? The company says yes, maintaining 90 rat days are roughly equivalent to 20-21 human years. Opposing scientists say no, the chronic impacts need a different protocol of study. 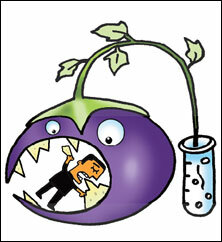 Furthermore, there is still the issue of how the Cry1Ac toxin breaks down in food and in our bodies. The company says its data shows the protein breaks down in cooked food and in our digestive system, but admits it remains active in an alkaline medium. The opposing view is that brinjal is sometimes eaten raw and that even our digestive system is mildly alkaline. The jury, as I said, is still out. Then there is the big issue whether you and I, who are going to eat this vegetable, can ‘trust’ the research largely been conducted by the company, the same that stands to gain the most if the go-ahead is given. Currently, all research is funded by companies and then presented to regulators for clearance. This leads to an enormous lack of credibility—people do not believe what the companies say has been done. And, given the horrific and scandalous track record of private research misguiding policy in the case of drugs or food, why should this be surprising? It is clear we need a new system: research must be publicly funded and openly scrutinized. The money must come from companies, but in the form of a cess collected into a fund. Without that, even good research will be tainted by bad public faith. My third reason for rejecting Bt brinjal is more basic and fundamental. Fact is I want the right to decide if I want to eat Bt brinjal or not. But India has no labelling system to distinguish the GM-hybrid from its lowly, ordinary cousin. You and I will have no choice. Furthermore, it is virtually impossible to set up a labelling system for a vegetable, in a country the size of India, where tests would have to be done on the farms of GM and non-GM crop growers. Labelling also demands the country must have a laboratory network and a functioning regulatory system, so that GM-content can be analyzed and told to consumers. This is far from the set-up we have in the country. cse, for instance, tried to get edible oil checked for GM traces but was turned away by most laboratories in India: they could not test or had limited facilities; the tests were prohibitively expensive or not possible. With Bt Brinjal, therefore, arises a similar problem of wanting ‘modern’ technology without ‘modern’ facilities to ensure safety and regulation. The same deadly combination. Over and above this, there are concerns about what this ‘foreign’ introduction will do to the biodiversity of brinjal—India is the centre of origin of this vegetable, over 2,500 varieties of which are grown here. While company scientists say Bt brinjal will not contaminate other varieties, research also shows that cross-pollination is definitely possible. Can we risk losing these staples—long, short, round or twisted—of our table? To me the outcome is clear: Bt brinjal is not worth the risk and the uncertainty it presents. This is not a verdict on GM crops. It is a demand for choice: to eat or not to eat. The minister’s decision, I hope, will be equally categorical.